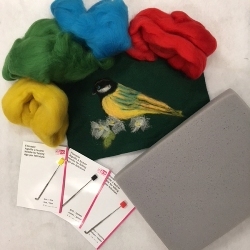 This set includes a grey foam Felting Mat with 3 different Felting Needles - Small, Medium and Large. It does not include instructions - Youtube has lots of videos. Fibres are sold separately, along with sheets of felt to use as a base (optional).